Back in spring of 2011 I wrote about a wetlands restoration project at Lake Junaluska – http://www.smokymountainnews.com/archives/item/3686-a-perfect-fit. Candace Stimson, in order to fulfill her Low Impact Development degree at Haywood Community College, unearthed Suzy’s Branch behind Jones Cafeteria and created about 100 feet of free-flowing stream and wetlands. I came upon the project innocently enough – birding one morning at Lake J. The area between Jones Cafeteria and the lake has always been a regular birding stop at the lake. There is a 12 to 15-foot ditch back there and a narrow strip of island with trees and shrubs. There are always two or three green herons nesting back there. Black-crowned night herons have also been found during migration and it’s good for other migrants like spotted sandpipers, teal and sometimes wood ducks. I remember making a mental note back then as I learned about the design and watched the installation of native plants – “this should attract a swamp sparrow or two.” I kept an eye on the wetlands last fall and winter – no swamp sparrow. I watched it this spring during migration – no swamp sparrow. Then, last Saturday morning, I dropped in and –bingo! – swamp sparrows. I found two of the skulkers. I only got brief looks but good enough for an ID. I bumped into a group from Carolina Field Birders at the lake and told them of the sparrows. I checked with Bob Olthoff later that evening and discovered that the sparrows hadn’t been relocated. Izzy (my daughter) and I had some time Sunday morning so we went by the wetlands. It took awhile, but after about half an hour of searching we turned up one swamp sparrow. This one was a bit more cooperative than Saturday’s birds, popping up long enough for good views. But the good views just created another dilemma. The sparrow was missing its central rectrices – the long stiff tail feathers that aid in flight. The plumage appeared to me to be adult; non-breeding. However, after some research, I discovered that juvenile swamp sparrows are known to prematurely (I assume before spring molt) lose their rectrices. But then, I also found that adult swamp sparrows tend to molt wing and tail feathers from August through October, so the middle of November wouldn’t be out of question. And, of course, the missing tail feathers could have another cause altogether, like a near miss from a predator. First winter and adult birds are similar in plumage. The adult generally shows a more reddish crown and a grayish breast. The immature shows a browner crown and a buffy tinge to the breast with some streaking. The gray face and nape of the swamp sparrow make it stand out from the more common song sparrows at the wetlands. And the swamp sparrow is a skulker. More likely to hit the ground than pop up and take a look like the song sparrows do. The wetlands also produced a Lincoln’s sparrow for Bob and I back in October. This migrant isn’t likely to hang around but the swamp sparrow(s) may, depending on food supply and weather. 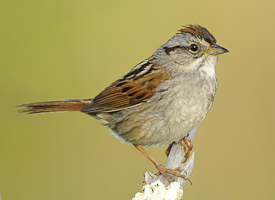 The swamp sparrow is known as a facultative migrant – it travels only as far as the cold weather pushes it. They remain all winter at places like Kituwah and Tessentee Bottomlands Preserve. But those places are a bit lower in elevation than Lake J and offer more habitat. But it will be interesting to see how long these guests stay.